Unusual mapping of the Indian Ocean in antiquity. An unusual and attractive 1658 map of the Indian Ocean, or Erythraean Sea, as it was in antiquity. Composed by Jan Jansson after a similar 1597 map published by A. Ortelius in his Parergon. Covers from Egypt and the Nile valley eastward past Arabia and India, to Southeast Asia and Java. Cartographically, India, Arabia, and Africa roughly correspond to the conventions of the period. Southeast Asia is less recognizable, but the Malay Peninsula, Sumatra, and Java are clearly noted. Most of the place names used throughout are derived from Ptolemy, who himself based his description of the region heavily on records from Alexander the Great's conquests. Two smaller maps in the upper left and right quadrants are of exceptional interest. The upper left chart shows northwestern Africa and is titled 'Annonis Periplus.' This is a reference to the legendary expeditions of the Carthaginian King Hanno, said to have been the first to access the Indian Ocean by sailing around the southern tip of Africa. Incidentally, en route, he is also said to have been the first to tame a lion. The upper right chart shows the northern polar regions as they were perceived at the time. A landmass covering the polar ice cap is indentified as 'Hyperborea.' To the left of this, roughly where North America rests today, the island of Atlantis appears; while Scythia, Europe (Thule) and Asia are on the right. Greenland and possibly Iceland appear at the bottom. 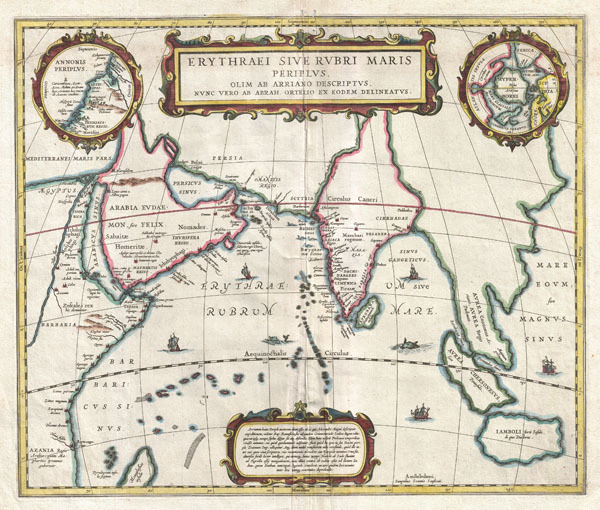 This map is intended to point out the possibility of a Northeast Passage to Asia, which was at the time being actively sought after by Dutch, English, and Russian navigators. Both smaller maps, the primary title area at top center, and an Latin explanation for the map at bottom center, are surrounded by baroque strapwork style borders. This remarkable map was published in volume six, the Orbis Antiquus, of Jan Jansson's Novus Atlas. Jansson, J., Novus Atlas, Sive Theatrum Orbis Terrarum: In quo Orbis Antiquus, Seu Geographia Vetus, Sacra & Profana exhibetur, Volume 6, 1658. Very good. Exceptional dark impression. Light creasing on and around original centerfold. Blank on verso. Koeman, C., Atlantes Neerlandici, Me 177A, 15. Van der Krogt, P. C. J., Koeman's Atlantes Neerlandici, 0500H:1. Keuning, J., 'The Novus Atlas of Johannes Janssonius', Imago Mundi, Vol. 8 (1951), pp. 71-98, no. 954.